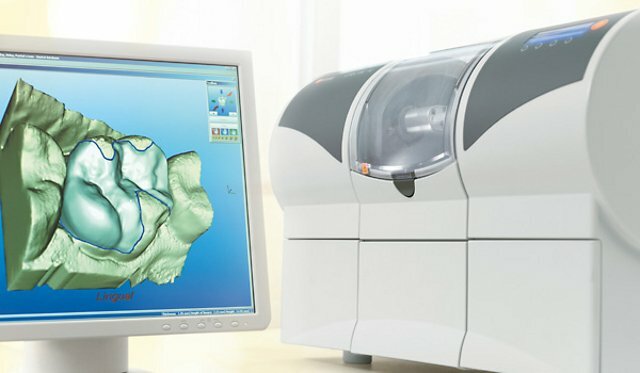 With new Cerec technology, crowns can be created and applied in a single dental appointment. That means complete tooth restoration in just one simple and painless office visit. Cerec same-day crowns are the perfect solution for your dental health needs. So, one of the most advanced procedures that we have to offer today is CEREC same-day crowns. In the days gone by, patients would come in for a crown, we would get the tooth prepared, we’d take impressions, it was messy. We had to make a temporary. Patients would wear that temporary home for a period of typically about two weeks. During that two weeks the temporary crown might pop off. They might have some problem. We’ve totally eliminated all of those patient concerns with the new CEREC same-day crowns. Today we can do the entire procedure in a very quick and efficient period of time and deliver a permanent restoration for the patient that same day. The advancement in this technology is phenomenal, and so now we can offer a procedure that’s better for our patient, provides a better clinical result, and our patients are happier. No one really wants to have a crown, but if you need one, you really want to have it done with the most advanced technology available.